Next Casino might not be the most well known online casino in the industry right now, but if you’ve never heard of them, then they might just take you by surprise. They are actually one of the fastest growing of a new breed of online casinos and have been touted as a possible rival to some of the biggest names in the business. The company were only established in 2013, so they give away a lot in terms of experience to most online casinos. We will be using this article to find out just how they have gone on to be so highly regarded by their peers and where we see them progressing in years to come. The company are a part of the EveryMatrix Ltd group, who own a number of other online casinos. The brand has only been about since 2013, but has already won accreditations for their innovation in casino gaming, most notably for their production of a stunning mobile version. In fact, you wouldn’t be wrong in arguing that the mobile version of the site is better and more functional to use than the site via desktop. The EveryMatrick Ltd Group are based out of Dublin, Ireland and as with all of their brands, are completely transparent about how they go about their business and also how to get in touch. Their licensing comes from the United Kingdom Gambling Commission, allowing them to legally accept players from a whole host of countries around the world. As Next Casino continues to move forward, it will be interesting to see if they can back up what’s an already host of online casinos from EveryMAtirx Ltd. In fact, the company are quickly becoming one of the biggest groups of online casinos in the industry, which makes them a very dangerous proposition for their competitors. 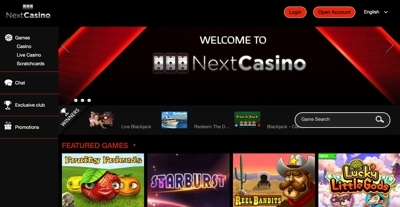 If you are looking for a safe, secure and entertaining online casino that supports mobile, then Next Casino would be well worth a look. The casino is powered by 6 software developers, including NetEnt and Microgaming, two of the biggest of their kind in the industry. With this comes a plethora of games to choose from and not only that, but they include a rake of progressive games, mixed between the two software providers. All casino games can also be used on Next Casino’s mobile app, which can be accessed by any mobile device simply by entering the casino on your smartphones browser.